Experience Adirondack camping less than 20 miles from Lake George! Stony Creek Family Campground in Stony Creek, NY is an Adirondack campground open from mid-May through October. Located in a beautiful wooded area near a creek, this campground is the perfect place to escape to and relax. The property features primitive tent areas and sites with hook-ups for your RV. 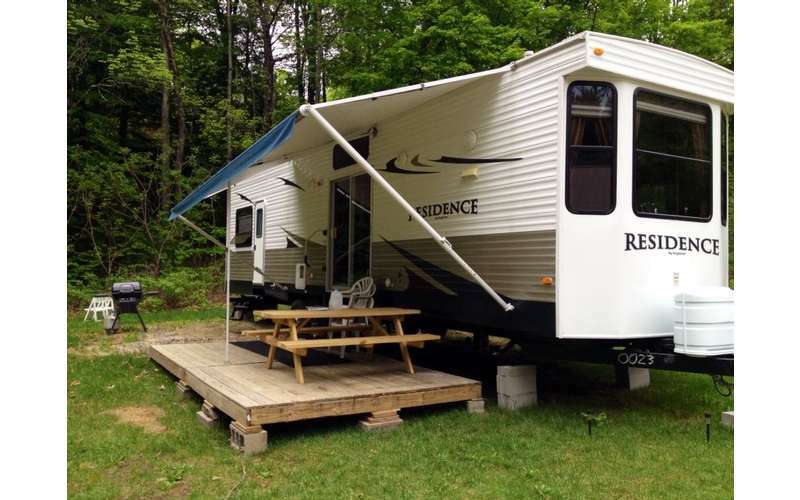 There are also trailer rentals that provide all the comforts of home, such as heat/air conditioning, kitchenette, sink, refrigerator, freezer, coffee maker, microwave, full bathroom with shower and tub, cooking ware and utensils, and more. Reserve one week and receive the 7th night free! All site reservations require a 50% non-refundable deposit. If you fail to cancel and not show up for your reserved dates, you will be charged the FULL amount of the reservation. Trailer rentals require a non-refundable 50% deposit at the time the reservation is made. If you fail to cancel and not show up for your reserved dates, you will be charged the FULL amount of the reservation. Checks can be mailed in for deposits on sites and rentals. Deposit must be received three weeks prior to reservation dates. All returned checks will be charged $35. Cash or check deposits have the same cancellation policy as holding a reservation with a credit card. No refunds for early departures. No pets allowed in any of the units. Ready to plan your trip? Contact them today to book your campsite! We LOVE this family friendly campground. The hospitality reminds me of going to my great grandmothers- you are part of the family when there AND catered to. The location is perfect. Far enough away yet close to so many things to do. And the sound of the Creek helps you relax even when you are watching the littles at the quaint pool. Family friendly in a great secluded peaceful area just a short drive to EVERYTHING! !